The Blue Jays are in great form, having won 7 consecutive games and 12 of the last 14, but they will be in for a real challenge tonight. Toronto locks horns with Tampa Bay, a team that grew a lot over the last couple of years but is still looking for its first World Series. Winning tonight in front of their fans will help the Canadians consolidate their position at the top of the East division, ahead of the NY Yankees. Marc Buehrle is the starting pitcher that the hosts will rely on tonight and they have plenty of reasons to be confident in his ability to carry the team to its eighth straight victory. The pitcher has been absolutely brilliant recently and he has a good record against the Tampa Bay Rays, so it is unlikely for him to require a lot of support from his offensive teammates. This doesn’t mean that Toronto will let Marc struggle tonight, when the offensive is firing on all cylinders and scoring runs doesn’t seem to be a problem. The Canadians took the opening game of the series by a wide margin and scored 10 runs, while allowing five. Basically, all that the starting pitcher will need to do tonight is to avoid a complete meltdown in the first couple of innings, so that his teammates will get the chance to overwhelm the Rays. Toronto has greatly reinforced its offensive division and results came naturally, with their runs production being significantly better than in 2013 and previous seasons. 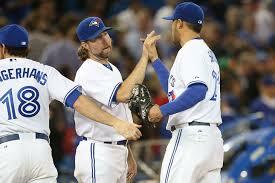 Perhaps the biggest accomplishment for the Blue Jays is that they have managed to win plenty of games on the road. At the time of writing, Toronto has won 16 games on other stadiums and lost just 11, a better percentage than in front of their own fans. This is the kind of performance that the team requires to have a fighting chance in the playoffs, but there is a long way to go before Toronto makes the postseason. The visitors are struggling in the second half of the division and the worst part is that Baltimore is above them, while Boston trails them by two points. The Red Sox have just ended their worst losing streak in more than two decades, but they shouldn’t be dismissed as out of the playoffs race just yet. Tampa Bay will have a hard time in closing the gap separating them from leading Toronto and another victory on the road tonight will only make matters worse. Alex Cobb is a great starting pitcher, but he only got to play two games this season and split those two decisions, while allowing an average of three runs per game. Any mistake he makes tonight will reverberate and it will be very difficult for his teammates to make these errors go unnoticed against Buehrle who is 9-1 this season. The bottom line is that Tampa Bay starts as underdog tonight and punters would be wise to back the hosts at full stakes at odds of 1.80.